Pharmafocus December edition and Pharmafile Autumn 2017 are both available now! Pharmafocus December edition is available to read online now! It's been an eventful past 12 months in the industry to say the least, and we end the year on some of the biggest news of all; after much speculation and campaigning, the future home of the European Medicines Agency has been confirmed as Amsterdam, The Netherlands. This was not without controversy however, with the final decision coming via lottery to break a tie with Italy's Milan. You can read the full details in our lead story, and don't miss out on the industry's reaction to the decision, further inside the issue. This of course means the UK will lose out on the benefits the EMA has brought during its stay in London. As the news broke that the agency would be leaving the city for its new destination, details of Chancellor Philip Hammond's much-anticipated budget were also released. The life sciences industry was appeased with a £2.8 billion cash injection for resource funding, while the NHS was promised £350 million to see it through the trying winter period. You can read the full details of the budget inside. To celebrate 'Movember' this year, Dr Matthew Hobbs, Deputy Director of Research at Prostate Cancer UK, discusses the challenges of tackling an exclusively male disease area, stressing that success will be achieved through conscious collaborative effort and precision approaches. Read his full opinion inside. Leading our in-depth features this month is a focus on real world evidence, with the latest insight and thought leadership from the Financial Times Pharmaceutical and Biotechnology Conference and a full-length interview with Dr Jacqueline Corrigan-Curay of the FDA, who outlines how the technology will continue to direct the US regulator's authorisation and pharmacovigilance efforts. But as it's the end of the year, we also have another gift to give: the Autumn 2017 edition of Pharmafile, our bi-annual market intelligence report for the life sciences industry, is available to read online now too! Throughout its pages you will find a wealth of the latest reports, developments and insights that build a comprehensive picture of the pharma industry as it stands today. We have compiled data and expertise from the industry’s foremost analysis firms and drug manufacturers to help illuminate the path forward into the coming year. We have collated the latest market analysis from leading research and industry organisations including Deloitte, Evaluate Pharma, GBI Research, Ernst & Young, Insight Pharma and more. You can also find insight from key pharma and life sciences associations such as the EFPIA and ABPI, as well as a foreword from BioIndustry Association CEO Steve Bates. 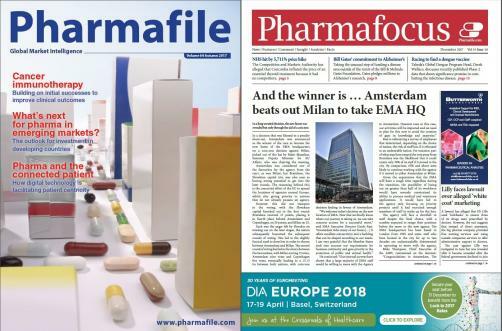 Pharmafile also features a valuable directory of key companies and service providers in the industry, ordered by sector and business, to ensure you can stay connected to some of the key players in pharma and life sciences today. Read the Autumn 2017 edition of Pharmafile online now!